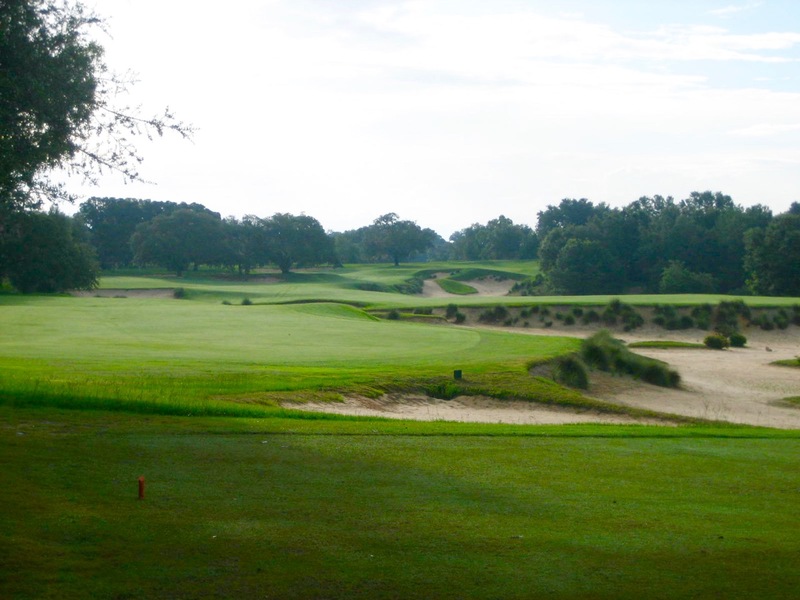 Things get real at Pine Barren’s par-5 4th with a safe-option drive to a big left fairway or a high risk play over the sand cavern to a short fairway on the right. 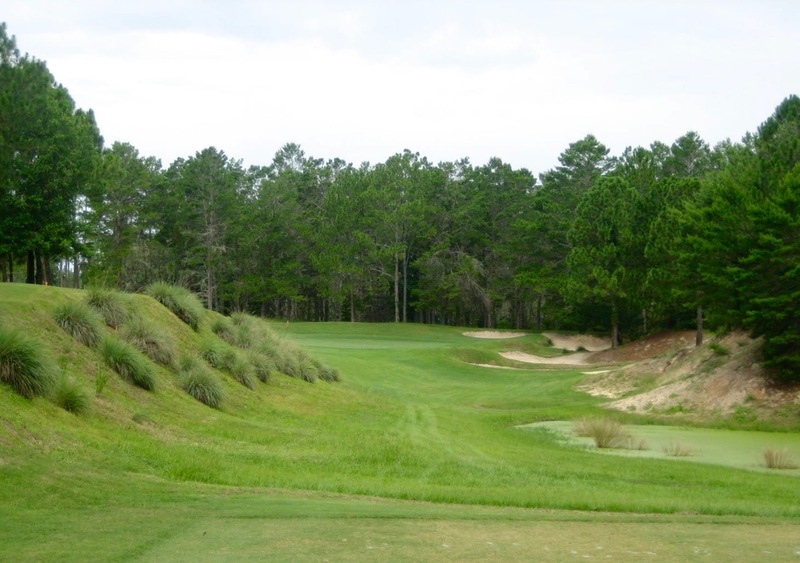 What does it say about Tom Fazio that the finest work to come out of his studio might be a public course in Florida that you can play for $50? It doesn’t square with the closed-door, big budget design extravaganzas we usually associate with Fazio, does it? He’s never built many public courses to begin with, much less affordable ones, so I’d be curious to know what all those owners who invested tens of millions of dollars for their ultra-exclusive Fazio club think when they see a course at least as good as theirs (and in most cases much better) delivered in such naturalistic and modest terms. The sand cavern to the right of the 4th hole was made by simply digging into the forested soil that existed naturally on site. 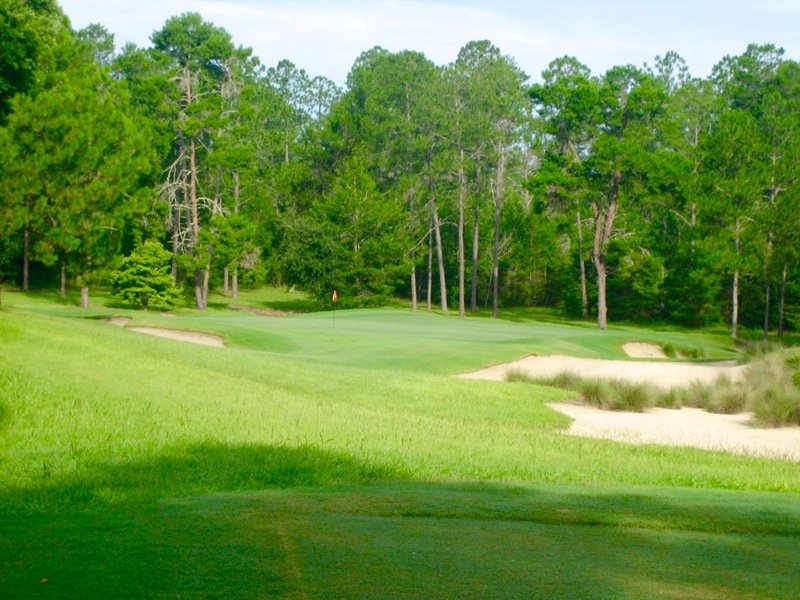 For my time and money, Pine Barrens at World Woods Golf Club, part of a 36-hole stand alone golf complex an hour north of Tampa (Rolling Oaks is the other course), is as good as Fazio gets. Largely because of a really good, sandy strip of rolling pine forest, there’s a gutsiness here that’s often missing in his work. 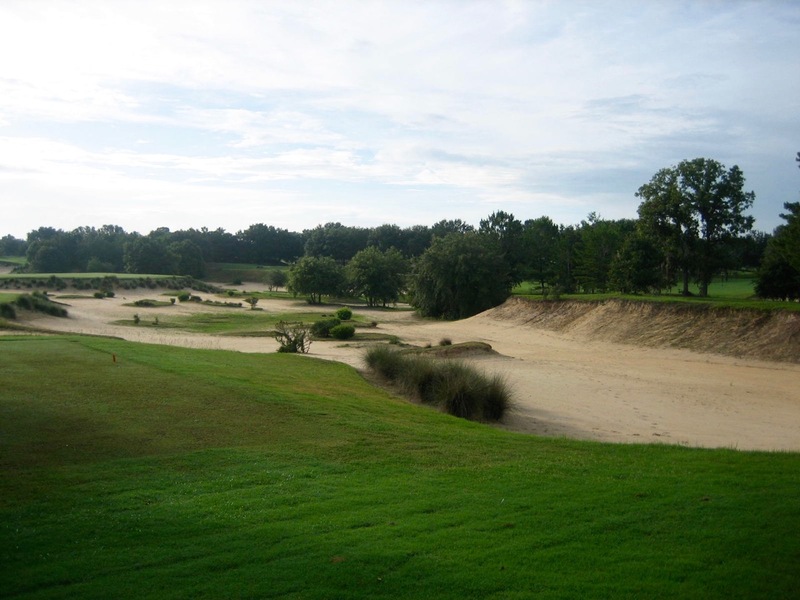 It doesn’t seem labored and it doesn’t seem produced, even though Fazio’s team chunked out huge sections of the topsoil to draw forth the deep, rugged sand caverns that define the course. Everything necessary to make a great course was right there in the soil, and Fazio took it all dancing. Keep in mind, this is an architect who usually chooses projects based principally on budget and client. He’s professed the quality of the land is a secondary concern, since he’s more eager to manufacture his own visions than coax out a course based on what the site gives him. 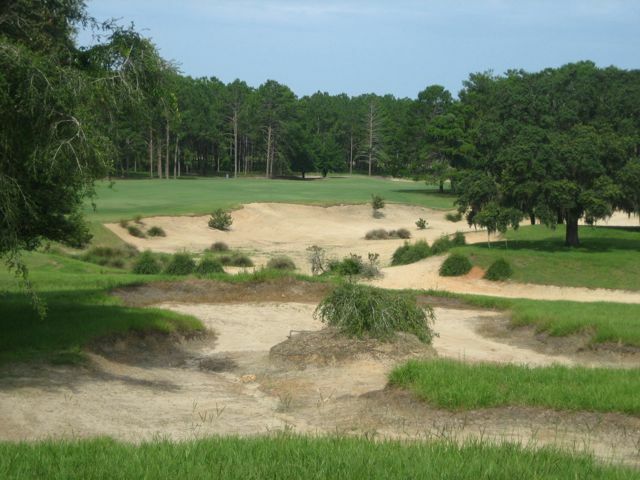 Yet Pine Barrens, all sand and slopes and scrub, is an ecstatic golf site and Fazio’s work here is extensive but not particularly complicated. It’s somewhat ironic that this is likely to go down as one of his most timeless creations. Drives carrying the farthest stretch of the waste area off the tee at 13 get a distance and directional advantage. Given Fazio’s architectural dominance over the last several decades, it might be surprising how few of his courses will have lasting relevance 50 years from now. Perhaps certain reputations will evolve in time, but his best courses are likely to be viewed as more influential than important. During a very critical and costly period in American golf architecture his work was at the vanguard of an imaginative design movement that demonstrated the marketability of highly curated golf spectacles, often at the expense of organic experience. An ode to Pine Valley, this is the upper of two different greens at the long par-4 12th. To a degree that hadn’t existed before, his work placed a wide — and widely emulated — emphasis on visual movement and perspective, a kind of idealized landscape aesthetic based as much on art and psychology and human tendency as anything actually found in nature. The pinnacle of this, of course, is Shadow Creek, a monument to engineering and fantasy golf RPG that, in converting a bare desert floor into a lush dream of forest, streams, reflection ponds and grass, turned premium golf course development into a schwartz-measuring contest for nearly 20 years. Fazio realized that to the modern player (at least his perception of the modern player, which happened, and perhaps happens, to comprise a solid majority) the scenery surrounding the hole was just as, if not more, critical to the overall experience as the strategies within them. Thereby he was justified in building and creating whatever he had the wherewithal to build and create. One gets the sense that he strove to deliver as much pleasure to those merely looking at his holes as to those playing them. At the drivable 15th, the option is to play safely to the left or carry the hazard toward the green on the right. This approach meshed perfectly with the Clinton-era’s business and entertainment largesse, and I can’t think of another designer who benefited more from that era’s peculiar ethos of boundlessness as Fazio did. No doubt those owners who might soon bristle at the sensuous economy of Pine Barrens realized they were paying premium prices for things that has little to do with golf shots. But hey, it’s their money. Whether he was better at nailing the setting or the golf, the future will judge Fazio as a visionary and an artistic maestro who was also a culprit in pushing a non-sustainable model of design and developmental excess that, when the real estate and golf industry bubble burst, became an immediate and irretrievable relic. Ultimately, his tableau is full of Cleopatras, Titanics and Iron Mans and not many Casablancas, The Graduates or Fargos: or in other words, courses big on set pieces and spectacle, short on substance. Picture perfect: the par-3 7th. Pine Barrens is is a rousing exception. The compact, dizzying routing turns constantly and touches every corner of a tight property making it seem much more spacious than it really is. Though the holes are often landmark in scale — the par-5 4th is an iconic hole, visually and strategically — the routing and level of detail in the greens and bunkering draws you in closer. Pine Barrens is the most intimate golf course I’ve seen from Fazio. The par-3 3rd, a short iron across a glossy pond, is a little too pretty for this course and is the only hole that seems out of place, even though there’s nothing delicate about the back-to-front, side-to-side tilt of the green. The par-4 5th and 8th holes utilize the sand features expertly to create variations in angles and depth perception, and the run from 12 through 15 — including two hulking par-4’s, a schizophrenic but fascinating alternate route par-5 and a fantastic drivable risk/reward par-4 — is as good a run of holes as your going to get in Florida. 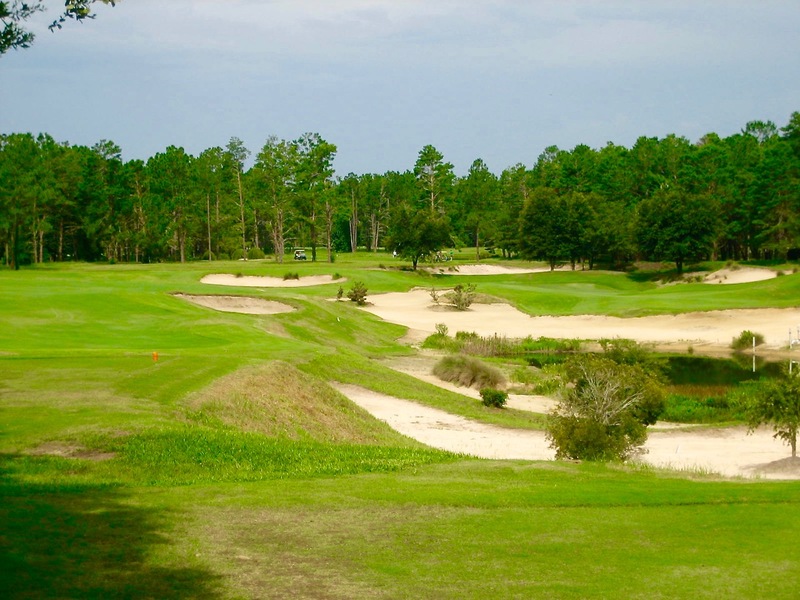 I’ll even throw the 16th in there too, a mid-length par-3 that’s carved down into an amphitheater of sand and pine trees with another severe side-sloping green. The par-3 16th is cut low into a mini amphitheater and features a wickedly sloped green.